What new capabilities does Hi-MD equipment provide vs. the existing Minidisc? What is "Domain Wall Displacement Detection" (DWDD)? Is this like DVD technology then? How did Sony increase capacity on the existing Minidisc to 305MB? What audio encodings and capacities exist on Hi-MD media? Is Hi-MD equipment compatible with original MD recordings? Can Hi-MD equipment record in the original Minidisc format? What happens if I try to play a Hi-MD formatted disk in a non-Hi-MD machine? If I reformat an original Minidisc blank to Hi-MD format, can I later reformat it back to the original Minidisc format? What happens if I try to record on a 1GB Hi-MD blank with a non-Hi-MD machine? What is the audio quality of ATRAC3plus? Can I drag and drop ATRAC files between a Hi-MD system and a PC? How is audio uploading from Hi-MD to PC conducted? Will I be able to use Hi-MD to upload analog-source recordings made on existing ("std-MD") equipment? How fast will I be able to transfer music from my PC to an MD with SonicStage? What are the technical specifications of the Hi-MD disks? What websites have Hi-MD information? Introduced by Sony in January 2004, Hi-MD is a nearly complete revamping of the original Minidisc system. 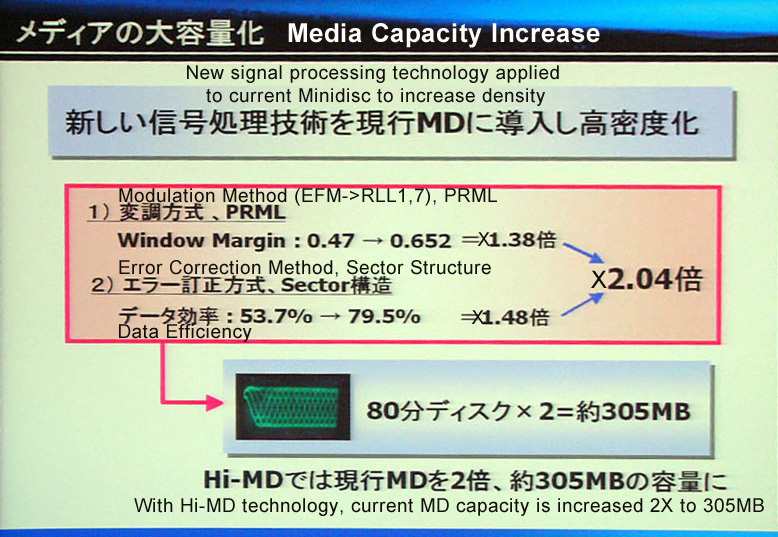 The most significant change is the introduction of Hi-MD media, which includes a new 1GB blank in the existing MD form-factor and a reformatting of existing MD media that doubles its capacity to 305MB. In addition, several important and long wished-for Minidisc capabilities have been incorporated into Hi-MD equipment. Hi-MD equipment can record audio to Hi-MD media in uncompressed PCM (16bits/44.1khz, i.e. CD format) as well as in Sony's ATRAC3plus encoding at 256kbps ("Hi-SP") and 64kbps ("Hi-LP"). Hi-MD recorders can be used directly as USB connected data drives on any PC supporting USB storage devices (no additional drivers needed). Microphone and line input (i.e. analog source) recordings made on Hi-MD equipment can be uploaded at high-speed to Windows PCs via SonicStage (Sony's copyright-protecting audio transfer software). There are two Hi-MD media formats: a new 1GB magneto-optical medium based upon DWDD ("Domain Wall Displacement Detection") technology, and the original Minidisc magneto-optical medium (60', 74' and 80') reformatted to double its capacity. The Sony 1GB Hi-MD disk is the first commercial use of DWDD technology (as of January, 2004). Domain Wall Displacement Detection is one of a class of optical readout methods called Magnetic Super Resolution ("MSR"). MSR techniques address the fact that Magneto-optical systems can write much finer than they can read; magnetic domains ("bits") can be recorded on the disk that are smaller than the laser spot*, such domains cannot be read back directly since the laser spot will illuminate several domains at once. In DWDD, the recording medium is actually a 3 layer sandwich consisting of (from top to bottom) the displacement (aka readout) layer, the switching layer, and the memory layer. When the switching layer is heated to its Curie temperature (which is below the Curie temperatures of the memory and readout layers), it allows a small magnetic domain in the memory layer to appear larger than it really is in the readout layer. The Magnetic Super Resolution technique was first discovered by Sony, and Sony has a DWDD patent that references 4 Canon patents. See Canon's DWDD explanation for further information. [*Magneto-optical systems like Minidisc that use Magnetic Field Modulation are able to record domains smaller than the laser spot because they actually create crescent shaped regions that are magnetized as the recording layer cools below its Curie temperature. The size of these regions is determined by the switching rate of the signal sent to the magnetic head. See Sony's pictoral description of MO systems]. No, it's completely different. DVD is an optical format, with closer tracks (0.74μm vs. 1.6μm), smaller pits (0.40μm vs 0.83μm), higher numerical aperature (0.6 vs 0.45), and shorter wavelength laser (640nm vs. 780nm) than CD/MD (MD uses the same optical parameters as CD). Hi-MD on the other hand is Magneto-Optical, using a laser to read and a magnet and a laser to write. In fact, Sony managed to create the Hi-MD system while holding to the original Minidisc's optical parameters, bringing the benefit of backward compatability and allowing them to manufacture Hi-MD equipment without a substantial change in cost structure. This means however, that pre-recorded 1GB Hi-MDs [that used CD Pit/Land recording] are not possible. The way data bits are encoded into bits on the disk (the modulation system) was changed from EFM ("Eight to Fourteen Modulation", the Compact Disc's method) to the more efficient RLL1,7 (typical of hard drives). The readout electronics were changed from a simple peak detector to a more sophisticated Partial Response Maximum Likelihood ("PRML") system that essentially uses digital signal processing techniques to extract the disk data signal from inter-symbol noise, allowing bits to be packed closer together. The error correction system and "sector structure" were changed to increase data packing efficiency to 80% (Sony doesn't mention what these changes were however). Changes #1 and #2 brought a factor of 1.38x, #3 brought 1.48x, for a total of 2.04x. All Hi-MD equipment will play original Minidisc recordings (this is a requirement of Sony's Hi-MD licensees). It depends upon the Hi-MD equipment, but it appears that all Hi-MD equipment introduced so far will record in all Hi-MD (PCM, Hi-SP, Hi-LP) and original-MD (SP, LP2, LP4) modes. Recordings made in the original-MD modes are only possible on std-MD disks formatted in the original (160MB) mode. If a 1GB Hi-MD is inserted, a std-MD unit will report a disc read-error. If std-MD media reformatted to Hi-MD is inserted, a std-MD unit will display "Hi-MD Disc" as the disk title. It will show two tracks, both tracks are named "Hi-MD Disc" with track-1 in mono, track-2 in LP4. Neither track will play (there is silence and the time counter doesn't show anything). The disk always shows no free space regardless of how much space is really available when used on a Hi-MD machine. Yes. Hi-MD formatting does not cause an irreversable change to the disk. Since a std-MD machine cannot read a Hi-MD reformatted disk (see above) you must first erase it (using "ERASE ALL"); it may them be used as a normal std-MD blank. The unit will report a read error and will not read/write on the Hi-MD disc. 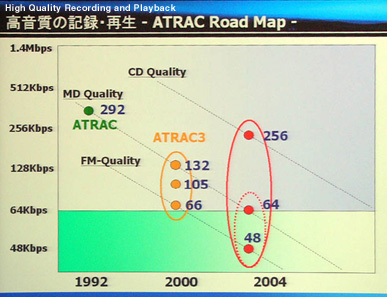 If indeed ATRAC3plus at 64kbps is equivalent to MP3 at 128kbps this is good news for two reasons: 1) 1GB blanks will be able to hold 34 hours of audio equivalent to MP3@128k and 2) ATRAC3plus at 256kbps should be quite good, and quite likely better than original ATRAC at 292kbps. No, SonicStage and SimpleBurner must be used to transfer audio between a PC and Minidisc. SonicStage (download) mediates all uploads from Minidisc to PC (or Macintosh, with Sony's MZ-M10 and MZ-M100 Hi-MD units). Conversion of uploaded audio to .wav format is done by SonicStage itself as of version 3.1. In prior versions audio may be converted to .wav file using Sony's Wave Conversion Tool (only for mic or line-in Hi-MD recordings) or using the MarcNet Hi-MD Renderer. Sony says that downloading can run at up to 100X realtime (assuming 48kbps audio content). Here are the specifications for the original Minidisc, its Hi-MD formatted version, the Hi-MD 1GB disk, and (for comparison) Sony's 650MB "MD-View" disk that was used in their Minidisc camcorder. AV Watch 1 and 2. Sony's first Hi-MD equipment announcement. MDcenter.nl's Hi-MD FAQ in Dutch. MDFr.com's Hi-MD FAQ en Français. A Russian translation has been provided by Best Sportscars Team. Copying Status: Public Domain. However, no liability is accepted for the correctness and safety any procedures or advice given here. This FAQ is distributed in the hope that it will be useful. Also, please include a notice that this file can be found at http://www.minidisc.org/minidisc_faq.html in any copies that you post. The Sony Europe MD FAQ liberally borrowed from this document, but nonetheless provides a good summary of the more complete document below. MinidiscForum.de has authored a German language Hi-MD FAQ.